Come join us this Memorial Day weekend hiking in the Sierras! This year once again we will be joining Camp Norge in Alta, CA for a taste of the Old West. 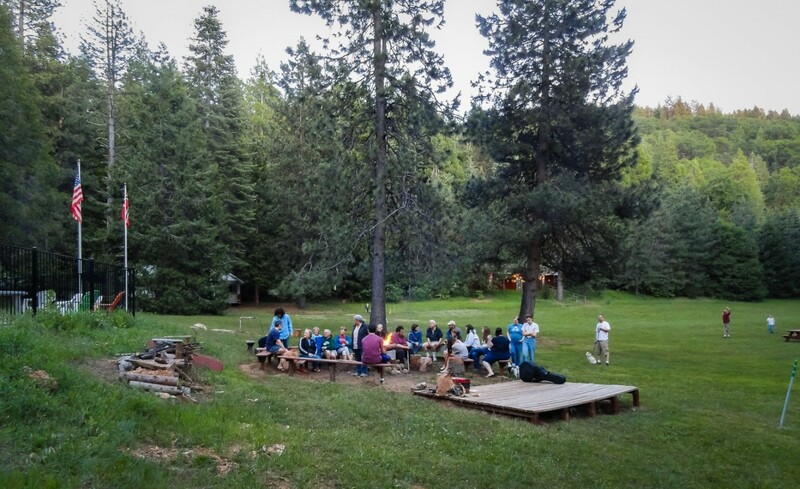 As the name implies, this 46-acre family camp was founded by Norwegians in 1957. It was a big hit last year, great for families, great for kids of all ages and we’d love to have you join us this year! Camp Norge is located an hour outside of Tahoe, making it a perfect place for day trips and day hikes. (Be sure to bring your bathing suit- we’ll be returning to Emerald Lakes, a gorgeous swimming hole right off the Yuba river with beautiful clear green pools with cliffs for jumping off and boulders to sun and picnic on!) We’ll have planned events during the day and lots of activities to choose from for every activity level. There’s great hiking and climbing nearby-rumor has it a climbing group is already organizing. And it really is for all ages- we had a wide range of people last year and there was something for everyone, from Smores and evening movies for the kids to aquavit tasting competitions for the bigger kids of all ages. A group “urban hike” to nearby Dutch Flat was a fan favorite last year, with a quirky and surprisingly awesome gold rush museum to boot. And for the gastronomically inclined there will also be a meatball cookout and Akvavit Tasting put on by Camp Norge- all competitors welcome! Details: Limited beds are available, plus ample tent and RV space. Hot showers, pool, fire pit, ample activity space (one huge newly renovated hall will show nightly movies)… and dogs are welcome! And don’t forget our annual YSC Memorial Day Happy Hour! Lodging: For those not wanting to pitch a tent, we have rooms available. Please sign up early, since these rooms go quickly! Several rooms are 2 twin beds to a room, some rooms have bunk beds and can accommodate more. For those staying in rooms you must bring your own sheets/sleeping bag/pillows. If you are bringing a dog you must let us know ahead of time since some rooms do not accommodate animals. We will try to the best of our ability to accommodate the needs of you and your friends or family. Meals: the YSC will be handling Saturday meals this year, so expect the good food that you’re used to at Clear Lake weekends! Meals are included Saturday through Monday morning (Friday there will be a kitchen available for use, but no meal planned), plus three nights of lodging (May 24-26, Friday through Sunday night). As with Clear Lake we will ask for people to sign up to help with cooking and chores but will streamline it to maximize time outdoors (ie. lunch will be bagged lunches for easy transport and minimal cleanup). Please let us know if you have food restrictions, we will try our best to accommodate. Space is limited so book now. Hope to see you there! $10/weekend, OK for RV and Camping, allowed only in certain cabins.